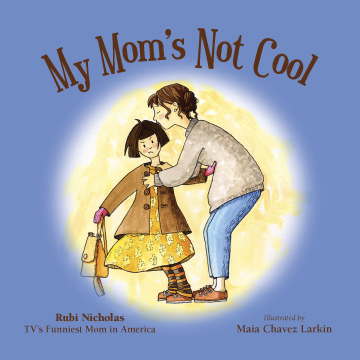 Rubi Nicholas has recently become a published author, with the Mother’s Day release of her illustrated children’s book, “My Mom’s Not Cool”. The book is published by Denver publisher Blueline Publishing and illustrated by Denver-based nationally-known illustrator and journalist, Maia Chavez Larkin. This completely original book, based on the author’s own children, tells the story of a little girl who thinks all the other moms she sees are way cooler than her own mom. The voice of the little girl is echoed by young readers and moms alike as a “must read,” by school counselors, psychologists and little girl critics as well! In one day's time, an 8 year old voices her opinion about her uncool mother, but in the end has the heartwarming realization that their relationship is not about "cool," but about love. Do you feel like all the other girls have cooler moms than you? Guess what, even the Funniest Mom in America has trouble being cool with her own daughters! In her first illustrated children’s book, Rubi Nicholas, winner of the 2006 TV reality series “Search for the Funniest Mom in America” she tells the story of a girl who thinks her mom just doesn’t cut it. Her story is a familiar tale of 3rd grade angst and a heartwarming realization that the narrator’s mom really loves her – and surprise – she loves her mom back, whether she’s cool or not! Pick up this fabulous read for your daughter, aunt, mom, or grandmother, just to tell her you love her.